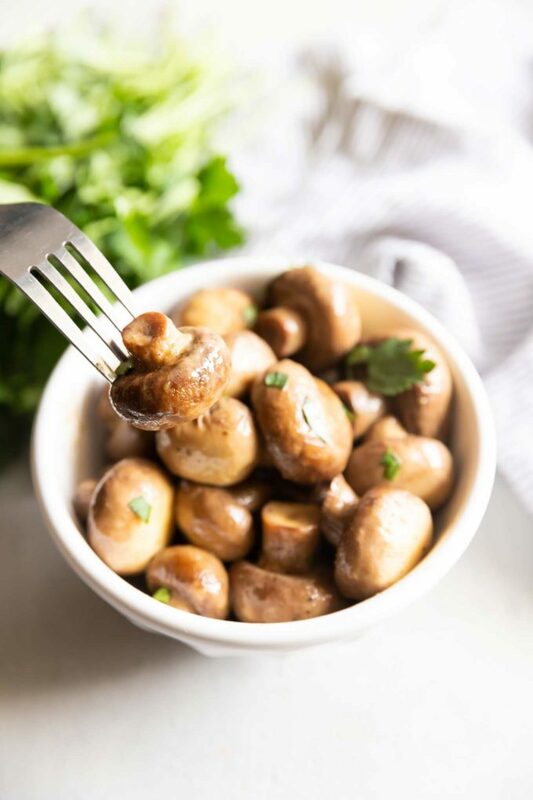 Buttery, and full of ranch flavor, the crockpot does the work for you with this mushroom side dish! Only takes 5 minutes to prep and 3 simple ingredients! So, tell me… what do you all think about mushrooms? Yay or nay? For me, it’s always a YAY! I love love love mushrooms… in any form! Raw, as a garnish, in a filling, roasted, stuffed… I could go on all day lol. If you don’t like mushrooms, we can still be friends… but you’re totally missing out on deliciousness! Do you have 5 minutes and 3 ingredients? I bet so… and if you do… you could be having these mushrooms. Tonight! That’s right you guys… 3 ingredients. THREE! Sorry I get super excited about simple meals, or in this case, side dishes. I don’t know about you guys, but when I’m planning meals for our family, I tend to get the main course covered, but will occasionally forget the sides. And by occasionally… I mean pretty frequently! That’s where side dishes like this are perfect… minimal effort, and HUGE flavor payout! CAN YOU PUT MUSHROOMS IN A SLOW COOKER? Absolutely! Or I wouldn’t be sharing this recipe 🙂 The reason people question it, is that mushrooms don’t take very long to cook, so when you slow cook them, you can run the risk of them being OVERcooked, and mushy. No one likes that! The secret here is to use whole mushrooms, so they take a little longer, and to only cook them for about 3 hours. Maybe 4 hours if you have some seriously jumbo mushrooms. 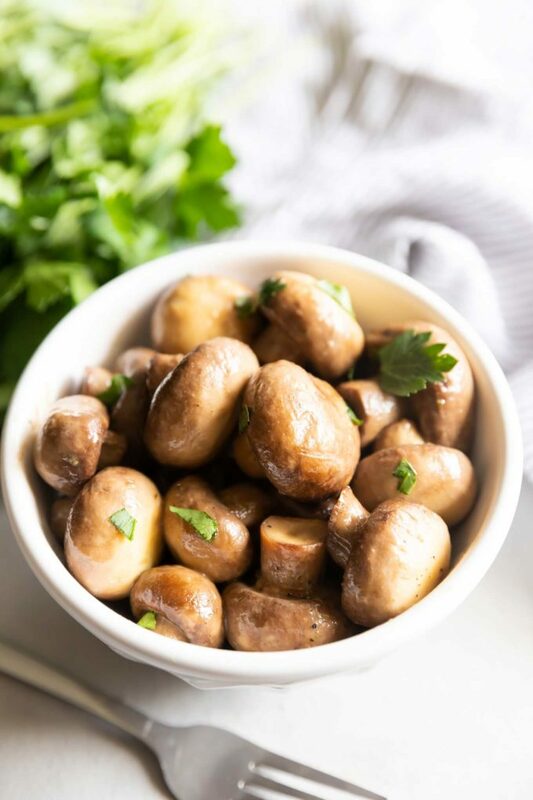 HOW DO YOU MAKE CROCKPOT MUSHROOMS? Buttery, ranch-y (yeah, I just made that word up lol), and completely delicious! Now I can’t guarantee that these are kid-friendly… as my kids have an aversion to mushrooms (how is that even possible, with parents who are mushroom obsessed?!). But what I can promise you, is that you won’t even want to share these mushrooms. If the mushroom stems are longer than you’d like, go ahead and give them a chop. I don’t mind a little stem, but more than and inch or so, and I chop part of the stem off. As you’re stirring the butter mixture around with the mushrooms, it will look like there’s not enough to coat them all. That’s completely okay. The mushrooms give off a LOT of liquid as they cook, and it all mixes together. If you’re not a fan of ranch dressing, don’t worry, zesty Italian dressing mix will work just as well. Not a fan of ranch dressing packets? Feel free to use your own homemade recipe. This one is our favorite. If you’d like to cut back a little on the butter here, drizzle in some olive oil to replace some of it. 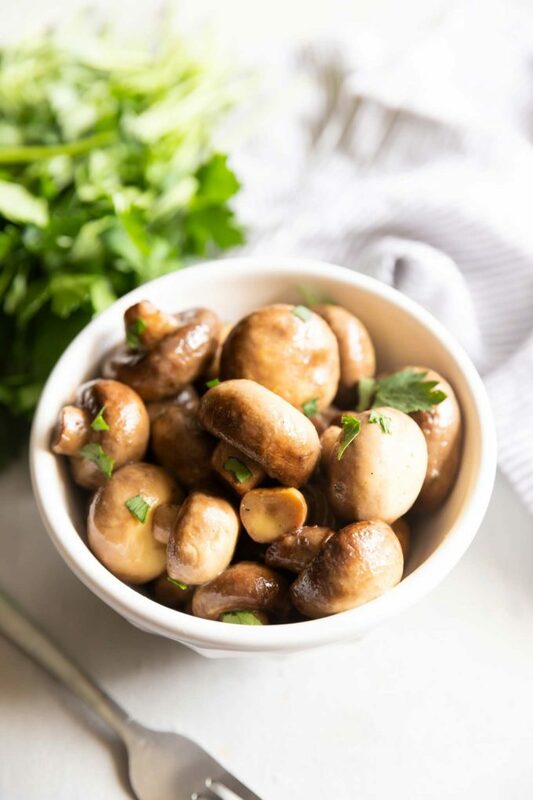 WHAT TO SERVE WITH CROCKPOT RANCH MUSHROOMS? Crockpot – My all-time favorite slow cooker! Post originally shared on April 20, 2015, and has been updated with helpful tips and new photos. 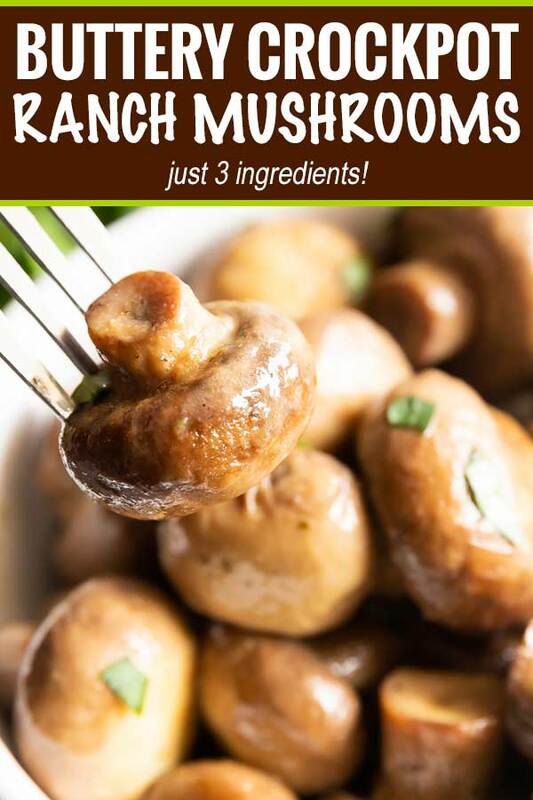 Three ingredients is all you need to make the most delicious and flavorful mushrooms! Just toss them in a slow cooker and let it do the work for you! 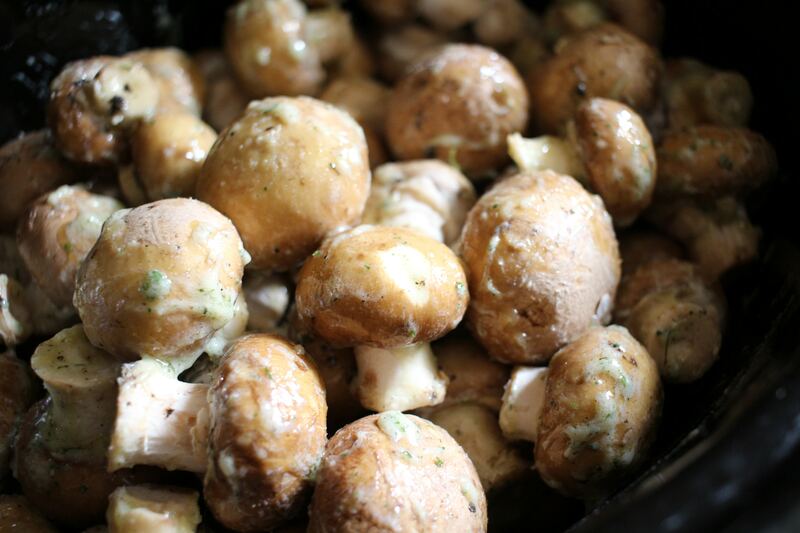 Clean mushrooms thoroughly, then place in bottom of slow cooker. Whisk ranch dressing mix into melted butter, then pour over mushrooms. Stir to coat. Cover and cook on LOW for 3 hours. Check for desired tenderness, and cook a little longer if needed. Serve garnished with fresh parsley if desired. I haven’t tested the recipe that way so I can’t say for sure that it will taste the same. How can those three ingredients not be amazing together?? I am thinking of all the meals I want to serve with these beauties! I’m going to try this as I love mushrooms but I’m going to add fresh garlic which I love with mushrooms thanks for the great recipe!!! These look delicious! Would love to give it a try! These need to be cooking in my crock pot today! Love the flavors! I am Angela and there are 7 in my household. 1 husband and 5 rambunctious kiddos and every one of us love mushrooms! I absolutely can’t wait to try this recipe! My family loves mushrooms. I like that it can be to cook quickly and easily. It’s really great! I love how easy these sound! Can’t wait to try this recipe out! 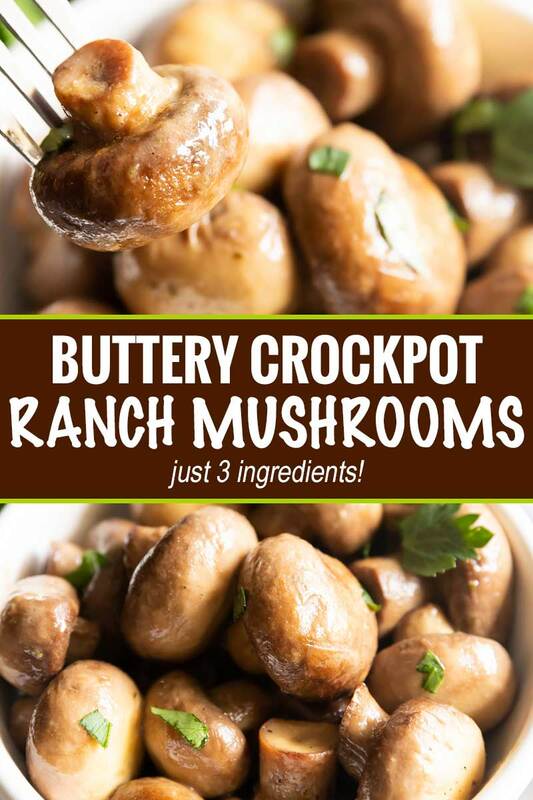 I’ve never made mushrooms in the crockpot, but it sounds genius! Great side for so many dishes! Would this work in an instant pot? How long would you cook them for? Hi Fallon 🙂 I’ve never tried it, so I can’t say for certain. I think it would work, I’m just not sure on the timing. My son-in-law brought these to a potluck. Everyone loved them ! The sauce would be excellent on rice. Love good recipes with few ingredients. Have you ever used Shiitake and/or oyster mushrooms for this recipe? I grow those mushrooms, and may have to try this. Thank you. Hi Jim 🙂 I never have, but I think they would be amazing! oooo what a yummy & super simple recipe!! Iove this! I have made a variation of these (adding about 1/3 cup Parmesan for each # mushrooms) and am now required to bring them to every event. Usually make 4-5 #s and they are the 1st thing to be gone. Best part my Mr. doesn’t mind making them! I made these for the second time today. Doubled the recipe this time. They are so so good. If you love mushrooms go ahead and double the recipe. Thank you for sharing. Hi Debbie 🙂 I’m so happy to hear that you loved the mushrooms! We love mushrooms and I’ve made them about every way I can imagine except like this!! But this is my favorite way to fix whole mushrooms. I even went & bought a smaller crockpot just for these!! Because everyone loves them so much they’ve even asked me to add them to my Thanksgiving and Christmas dinners!! Now this is a big deal at my house because 34 years ago after our first holidays together…my husband asked me to never change a thing I had made!! In the all these years I’ve only added 2 things & this is one of them. These are also on a regular rotation at my house no matter what I’m fixing. I’m making a chicken casserole tomorrow and wanted a couple of different sides but not the regular same old sides. So I’m fixing these & roasted onions with parmesan cheese sauce. Thanks for the great recipes!! Hi Patty 🙂 Oh man, this comment just made my night!! I’m SO happy to hear that everyone loved these mushrooms!! Such a high compliment that they’ve been requested to be added to such important holiday dinners 🙂 Thanks for such a wonderful comment! 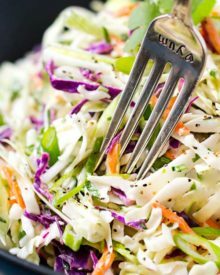 Yummy side dish and I love that it’s so easy. IT’s great when a slow cooker recipe doesn’t actually need a lot of preparation in advance. Your Slow Cooker Ranch Mushrooms look delicious. Hope you are having a great week and thanks so much for sharing with Full Plate Thursday. What a great idea Amanda! 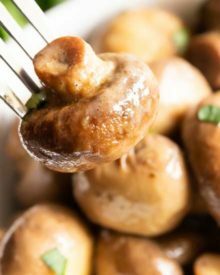 These mushrooms look amazing and I love how easy they are to prepare. 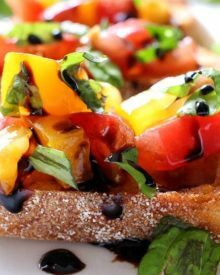 Great as an appetizer or side dish! Amanda, your pictures are gorgeous! I’m already a huge fan of mushrooms, but you’ve just made me fall in love all over again! Never thought to cook them in a slow cooker. Definitely going to try this! I think ranch-y should definitely be added to the dictionary. Thanks for sharing at ‘Tell em Tuesday’! I adore mushrooms and love the idea of just noshing on a bowl full! Yum! These look absolutely fabulous! 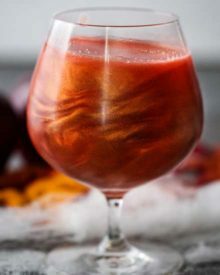 I wish more of my family liked mushrooms, but my youngest son and I do, so I’ll have to make these as a special treat for us! Pinning! On name alone I had to check this one out! Looks and sounds great, I’ll try it soon. Thank you!! Was it the “ranch” that drew you in? 😀 Hope you LOVE it! I’m always on the lookout for different side-dish options and this one is PERFECT, and you can make it right in the slow cooker so you don’t even have to think about it! I LOVE it, I can’t wait to try these… they’re so simple! WAHOOO!! !